If anyone thinks they are something when they are not, they deceive themselves. Each one should test their own actions. Then they can take pride in themselves alone, without comparing themselves to someone else, for each one should carry their own load. 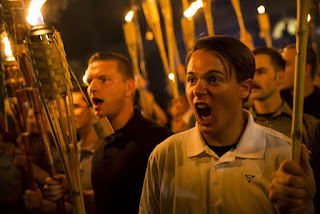 The horrible events of last weekend in Charlottesville, Virginia, have been made all the more horrible in the eyes of many around the world by the response of our President. Even many of his party, and many who have been supporters of him, wondered why he had little to say at first, then cringed when he seemed to equate the counter-protesters with the white supremacists they were standing against. He backed off that a little eventually, but then seemed to double down on it a day later. Americans wondered why our leader, who is usually quite quick to assign blame, wasn’t willing to simply denounce Klan members and neo-Nazis, without feeling the need to compare them to those who stood against them. Especially when one of them drove a car into a group of counter-protesters. It’s puzzling because it should be easy to say that Nazis and the Ku Klux Klan are bad….period. It’s a slam dunk. We fought a couple of wars over that. The only people who will take offense are…well, Nazis and the Ku Klux Klan. You can speculate about why President Trump refused to be more direct in his condemnation of white supremacists. But what he engaged in is a form of what’s called moral relativism. It’s a kind of ethical gymnastics that lets us say that there is nothing really objectively good or bad, and so morality is on kind of a sliding scale. Crucially in this case, it allows us to compare our own morality with others’. Because if there isn’t an objective good or bad then all I need to be “good” is to be no worse than anyone else. On a personal scale, you’ve engaged in moral relativism if you’ve ever said (or thought) something like this: Well, that wasn’t good. But at least I didn’t (where X is some kind of behavior that to you is much worse than whatever it is you did). You’ve engaged in moral relativism if you’ve ever tried to excuse your own actions by comparing them to someone else’s, like if your wife accuses you of speaking harshly and you remind her that she yelled at you last week. Why is that relevant? Why does it matter? Because you’re not operating on the idea that there’s an objective “good” in the matter of how you speak to your wife. You’re operating on the assumption that you only need to be as “good” as she is. Sometimes moral relativism takes the form of Who are you to judge me? That is, a person isn’t qualified to call me out on my behavior if there’s anything in his life someone could call him out on. Jesus said something that sort of sounds like that, but he also assumed that there were times when you would need to show someone their fault. But if there isn’t a moral standard, then really who is anyone to say anything is wrong? President Trump took his moral relativism last weekend quite a bit farther than most people are comfortable with. Again, hardly anyone thinks that it’s good to be a white supremacist. But let’s not imagine it isn’t a predictable turn of events if we assume that we can only evaluate morality on a curve. Because there’s always someone who can skew the curve downward. That’s why Paul discouraged the Galatian church from comparing themselves to one another. On the one hand, if you compare yourself morally and ethically to the “right” people, it can make you feel unreasonably proud of yourself. Think of Jesus’ story of the Pharisee and the tax collector: the Pharisee feels good because, compared to the tax collector, most everyone would think he’s the better person. He prays about his own resume and belittles the tax collector, who admits his sinfulness and asks for forgiveness. “Which of these guys went home justified before God?” Jesus asks in the punch line. Answer: not the “good” one. On the other hand, if you compare yourself to the “wrong” person you make that person the standard. Your aspirations become not to be like Jesus, but to be like that person. If you succeed, you feel pride. If you don’t, you feel despair. If some in our world don’t care for the idea of giving an account to God, some Christians don’t like that word “ourselves.” After all, if there’s an objective standard of right and wrong, then shouldn’t it apply to everyone equally? And isn’t it up to me to see that everyone complies? That’s been the majority opinion among some Christians in different places and times. It can still tempt us in our own place and time. But no human being is ever the right standard for morality. Not even you or me. We all get it wrong sometimes. We can’t know each others’ hearts. And the Lord hasn’t given us enough information to always know right and wrong flawlessly every time. Or even most of the time. That’s why we should test our own actions, carry our own loads, and assume that other believers love the Lord too and want to obey him as much as we do. There are times, though, when right and wrong is a slam dunk, when there is no doubt who’s on the right side. May we be very humble about that. May we never give in to hating those on the wrong side. But may we not be reluctant to speak for good and against evil — preferably in that order — when the need arises. No, we aren’t perfect. But neither are we the standard. God is our standard, and when people are mistreated, when injustice rules the day, when the strong run roughshod over the weak, his people must speak against it. We must do it with love, but we must do it. May we be faithful in that, even when those who should be are not.